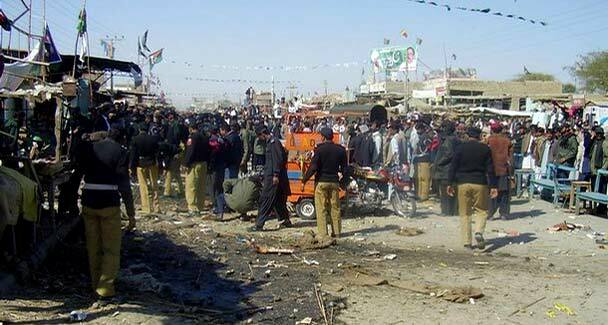 QUETTA: Three people were killed and eight were injured in an explosion in Balochistan province’s Jaffarabad district on Thursday. District Police Officer Jaffarabad, Syed Farid Ali, told DawnNews that the blast took place as an explosive device went off in a small restaurant in Sohbatpur town. Police rushed to the site after the blast and shifted the bodies and injured to a nearby hospital. The blast site was cordoned off and an investigation was underway. QUETTA: Thousands of Balochistan police personnel performed their duties without weapons on Wednesday after they were not issued arms from their headquarters for the second day running. The provincial government had sealed the armouries of the Balochistan Constabulary, Anti-Terrorism Force and Police Training College after Monday’s violent protest by policemen demanding a raise. Frontier Corps personnel called in by the provincial government after police’s strike were guarding the sealed police koths. 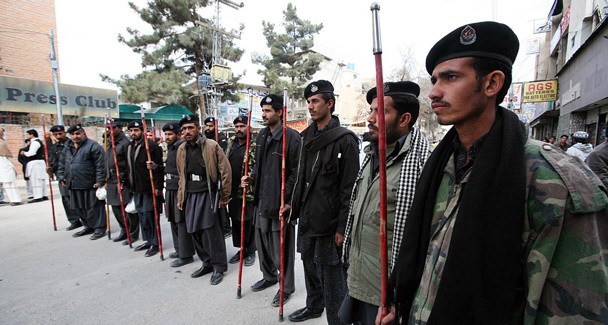 Personnel of Balochistan Constabulary and ATF were seen with batons issued to them in place of AK-47 rifles used by police in the province. “Weapons will not be issued to the personnel of the BC, ATF and PTC until legal action is completed against policemen involved in violent protest,” a government official told Dawn. According to sources, there is no restriction on officers above the rank of assistant sub inspector carrying weapons. Chief Minister Nawab Aslam Raisani has asked acting provincial police chief Mohammad Akbar Arain to take strict action against police officials involved in violence, the sources said. Footage from cameras installed at the gates and inside the CM’s secretariat and Governor’s House is being used for identifying personnel involved in firing and damaging property. More cameras have been installed along the road near the Governor’s House and Chief Minister’s House. He said the situation was under control and no report of police protest had been received from any part of the province except Loralai, where a group of personnel had taken out a procession. He said the violence appeared pre-planed because police recruits inducted just two weeks ago had been brought to the city from the training college. He said a DSP and other police officials who had brought the recruits from the PTC had been arrested. Frontier Corps personnel continued guarding important places in the provincial capital, including the governor’s and chief minister’s houses, the provincial assembly and main bazaars. All vehicles moving on the Zarghoon Road and their occupants were checked. The Civil Secretariat and houses of the governor, the chief minister, several ministers and the chief secretary are located along the road. Pakistan is always afraid of Balooch agitation for autonomy of the Province and consequently do not want to empower the Balooch Police Force as to avoid any suspected armed Police Revolt within the Police there on demand of Autonomous Baloochistan. 12 Taliban militants were killed and three others injured in clashes between Salarzai laskhar (pro government Tribal militia) and militants in Chinnar village of Bajaur Agency in Federally Administered Tribal Areas (FATA) on January 27, according to Daily Times. The volunteers from the Salarzai lashkar, backed by Security Forces (SFs) were on their way to Mula Said and Chinnar areas when a group of armed militants attacked them. The SFs and members of the lashkar repulsed the attack killing 12 militants and injuring three. One trooper was killed in the attack. 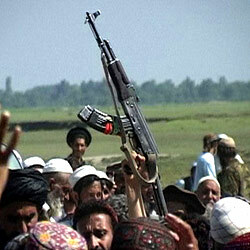 Further, Taliban militants killed a pro-government lashkar leader in Bajaur Agency. The body of Malik Manaris Khan, 47, was found in Salarzai town. He was abducted on January 25 along with two other tribesmen, Malik Ali Baz and Malik Muhammad Rehman. The former is still held captive by the militants while the latter has been released. Separately, a tribal elder, Malik Saleh Khan, had a narrow escape when a roadside bomb went off in Nawagai tehsil (revenue unit). Meanwhile, the political administration has warned tribal chieftains of a military operation if they do not take action against terrorists who have fled Mehsud areas of South Waziristan and have taken refuge in North Waziristan. Further, after several days of silence, rumours were once again circulating that chief of the banned militant group Tehrik-e-Taliban Pakistan (TTP), Hakeemullah Mehsud had died of fatal injuries that he had sustained in a drone attack in Shaktoi village of South Waziristan on January 14. However, sources close to Hakeemullah Mehsud denied such reports and claimed he was in good health. Courtesy : Dawn News, Reuters, AFP, South Asian Terrorism Portal & Others. For a different cause of Fanatic Religion of peace inside Pakistan. There are two types of reporting done on Pakistan. One, the ‘been-there-seen-it’ kind that mediamen in the West are known to have a special knack for. The other is armchair theorizing, the forte of a group that calls itself Pakistan-watchers. The second obviously lacks the thrill and personal touch of a first-hand account, but a long shot of events often provides an insight the first kind may not reveal. That is what keeps research foundations hedging their bets on the armchairwallahs. It is a tad disappointing when a work sinks in between the two stools, which this book does. Despite the unusual data Wilson John uses, some of the startling revelations he unearths, and brief spells of clearheaded analysis, the book is lost in the heap of information that John feeds his reader. The ‘info’ breaks the narrative in the most unexpected places and leaves one groping for the line of argument. It annoys one to no end because some of this information (not altogether unknown) is repeated, sometimes verbatim, in the later sections of the book. To take just one example, a paragraph John cites with Ahmed Rashid’s quote from a Tehelka report on page 182 reappears in its exact form on page 238. There must have been others, for several times I was left feeling that I had read something similar only a few pages ago. This trait, detected in other “research works” that base themselves heavily on secondary sources, neither speaks highly of the researcher nor of those who edit such works. The central thrust of John’s book is to look at the way the civil society in Pakistan is changing, imperceptibly but determinedly — a facet often overlooked by critics of the country’s civilian and military leadership. John, however, acknowledges that this change is steered by the Pakistan State itself in order to “justify its overt use of terrorist and extremist elements against its adversaries”. The radicalization effected not only makes the civil society encourage further radicalization but also to become an active participant in the process. Wilson John is a well-known investigative journalist, specialising in matters of defence and security. He has been credited with exposing many controversial deals and decisions in the defence establishment. He is at present a Consulting Editor with The Pioneer, New Delhi. Much of this change happens through education. As the co-founder of Jamaat-ud-Dawa (a major focus of John’s analysis) and colleague of Hafeez Saeed, the JuD chief, pointed out, it would be impossible to establish the “system of Allah in the world” without education. There are two things that John emphasizes here. One, he tries to dispel the notion that madaris alone promote Islamic education and popularize the notion of jihad. The failure of the State school system has brought in major players in the form of religious organizations and jihadi parties which have set up chains of their own brand of model hybrid schools that make religious education and jihad just as popular as the traditional madaris. (They, in fact, follow the guidelines laid down by the curriculum wing of the ministry of education that makes it mandatory for the schools to enable a Class V child to “make speeches on jihad and shahadaat” and “understand Hindu-Muslim differences”.) And they educate women in enormously large numbers to have control on the mental universe of the future generation. The second thing John wants to stress is that jihadi outpourings in Pakistan are not the function of economic disparities that have resulted in a class war. Yes, the typical population in madaris may be poor, but the students there are not necessarily more predisposed to terrorism than the products of Pakistan’s elite secular institutions. In fact, the research he accesses show that since the latter lacked basic knowledge about Islamic teachings and the value attached to life, they may be more “amenable to getting involved in ruthless acts of terrorism”. In Pakistan, and elsewhere, that is precisely what is happening. Children of elite institutions are quitting school to rough it out in the terror camps with the blessings of their parents. Or else products of renowned international institutions are coming home to take on their share of the mantle of the global jihad. The last indicates a fundamental change in the profile of the jihadist. A class apart from the recruits in madaris or those indoctrinated through intense courses in religion who fight side by side with the literate or illiterate in the fronts in Afghanistan and Kashmir, the net-born, e-coached, highly-educated, jeans-clad jihadist is a loner who forms his linkages with global jihad in his room, is less amenable to control than the innumerable fidayeens on the battlefield and perhaps more devastating in his impact on the world. John goes into intricate details of how the JuD is fostering changes of all kind and linking up the jihadist world through its associations with the like-minded in the Arab nations, in India, the West, and within Pakistan’s bureaucracy and the army. There are fascinating accounts of Lashkar-e-Toiba camps, of indoctrination meetings where women sacrifice their sons as easily as their jewels to the cause. Incidentally, many of these are attributed either to reporters or analysts who are not named in the text or in the footnotes, which appear generously at the end of the pages. John’s analyses, when they are not swamped by information, are remarkable. Consider the Pakistan army operation in Waziristan, the failure of which he blames as much on the inaction of the allied forces as on the sentimentalism of the Pakistan army officers. He also does an enormously useful summary of the jihadi movement in India and the jihadist linkages in Kashmir. However, one cannot rate his sensational account of ISI officers and Pervez Musharraf as highly. Nor can one give him the credit he lays claim on for prophesying that terrorist groups will “adopt new techniques or a combination of old modus operandi” to launch future attacks on India. That, one dares say, is obvious. 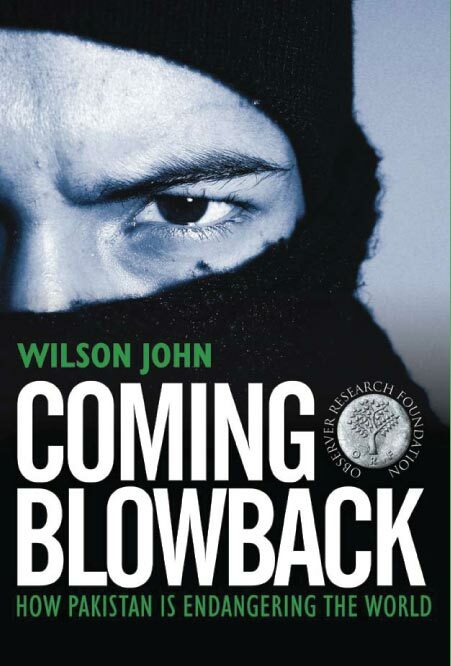 Tags:Book by Wilson John, Coming blowback: How Pakistan is endangering the World, Jihad, Rupa & Co.
AK-47 or Kalashnikov Culture in Pakistan made it ‘hell’ for Humanity and ‘heaven’ for Terrorists. 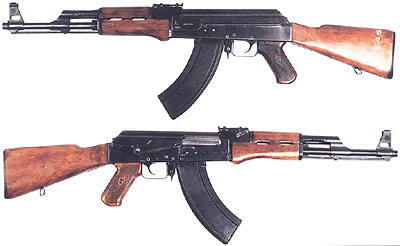 flooded with AK-47s, smuggled across by Afghan refugees. By Nadeem F. Paracha || Monday, 11 Jan, 2010 || Courtesy : Dawn. Violence in Islam violates all rules of Peace. This truth triumphs in Karachi and everywhere. Political violence sparks protest in Karachi. KARACHI: Thousands of people poured onto the streets of Pakistan’s financial capital Karachi on Monday to protest at a security crackdown after dozens of people died in political violence. Security officials say up to 48 political party workers have been killed in Karachi since Thursday, when the headless body of a worker from the city’s main political party, the Muttahida Qaumi Movement (MQM), was discovered. Karachi sees sporadic outbreaks of political violence, reflecting tensions between the MQM, which represents Muslims who migrated from India, the ruling Pakistan Peoples Party, and the Pashtun nationalist Awami National Party. City police official Mehtab Ali said between 8,000 and 10,000 people participated in the rally. Another officer reported skirmishes. “We did not stop them from holding the rally. They wanted to go to the chief minister’s house, but we prevented them doing so by firing tear gas on them,” police official Mohammad Ashraf said. As the wave of killings gripped Karachi over the weekend, Interior Minister Rehman Malik ordered patrols by police and paramilitary rangers to curb the violence. He said political parties were not involved in the killings. But protesters from Lyari, an impoverished neighbourhood of Karachi and stronghold of the Pakistan Peoples Party (PPP), said the security crackdown was targeting them and not MQM supporters. “The government is victimising its own people to appease its political allies, the Muttahida Qaumi Movement,” said Habib Jan, an organiser of the rally. A police official who asked not to be named because of the political tensions said six suspects had been arrested on suspicion of arson and inciting political violence. The MQM is the coalition partner of President Asif Ali Zardari’s PPP in the southern province of Sindh, but there remain tensions between supporters of both parties. Courtesy : AFP, Reuters & Dawn. Ten more fall prey to targeted killing in Karachi. By Imran Ayub || Monday, 11 Jan, 2010 || Courtesy : DAWN. KARACHI: Ten more people, including political activists, were killed in different parts of the city on Sunday, as law-enforcement agencies remained unable to control the recent spate of killings. The tight measures taken for the security of President Asif Ali Zardari and visiting British foreign minister David Milliband in the city could not prevent the incidents of abduction and killing. Most of these killings, however, were reported in the early hours of Sunday or after sunset. Two young men were shot dead by unidentified attackers outside a restaurant in Sector 32-D of Korangi. The Korangi Industrial Area police said that Sabit Hussain, 26, and Mohammad Rizwan, 30, were sitting outside Sharjah Restaurant when two men riding a motorbike arrived and opened fire on them. Six more shot dead in Karachi. Situation under control or to be worsening ?? KARACHI: The ongoing spell of target killings and firing incidents claimed more six lives in Karachi, raising the death toll in last 24 hours to 13, Geo News reported Sunday. According to police sources, at least 41 people have lost their lives during the last four days in various areas of the city. The bodies of two unidentified men were found near Malir River in the limits of Shah Latif police station; they were shot down. Syed Ikhlaq–an activist of a political party—has been gunned down in Nazimabad Khamosh colony and 20-year Zeeshan s/o Noman was killed in Old Haji Camp firing incident. Body of Irfan Lahoti was found from Idgah area; the deceased is said to hail from a group based in Liyari. In Sarjani Town also, some unidentified men killed a man Shahid Iqbal with gunshots. 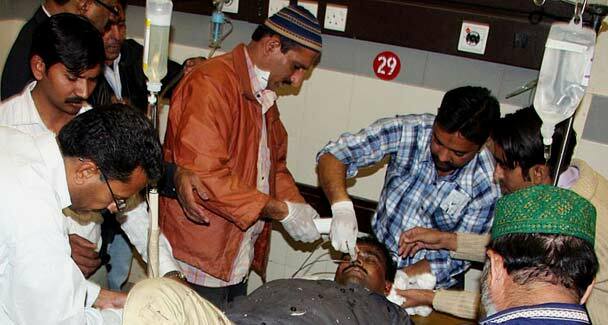 Latest four more people died in sporadic incidents of violence in various parts of Karachi on Sunday, DawnNews reported. Nine people were killed in target killings in Karachi on Saturday, raising tensions between coalition partners Pakistan People’s Party and the Muttahida Qaumi Movement. Tensions were high, with the MQM threatening to quit the ruling coalition both at the centre and in Sindh. A total of 31 people have lost their lives since Thursday as gun battles and aerial fire shook large swathes of the city’s old quarter. Security personnel also came under fire. The situation in Lyari, Pak Colony, Ranchore Line, Garden and Kharadar was being described as tense by law enforcement agencies. Courtesy : Dawn, The International News & Other Agencies. 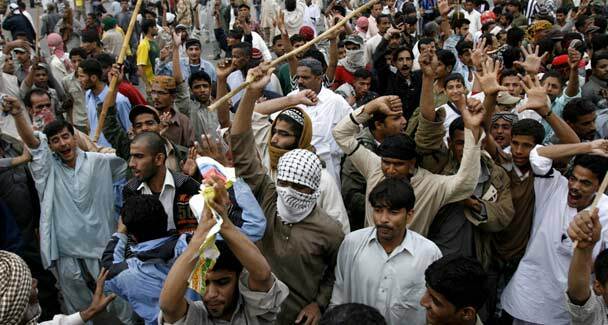 Karachi Clash for Islamic Peace. 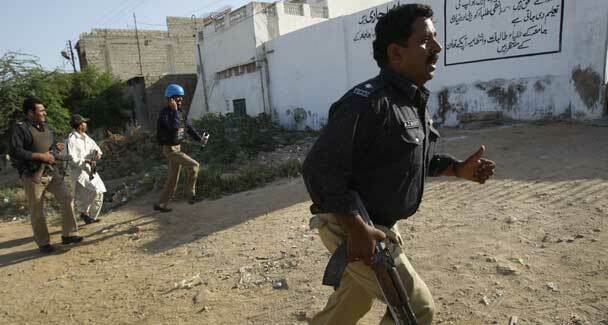 KARACHI: At least seven people have been shot dead and several others injured in a firing incident in Karachi. According to the police, violence erupted after the body of an MQM worker packed in a gunny bag was found in Chakiwara area of Lyari. A senior police official told DawnNews that Lyari gangsters are trying create friction between the Baloch and Urdu speaking communities and the main agenda of the violence to sow their influence in the area. 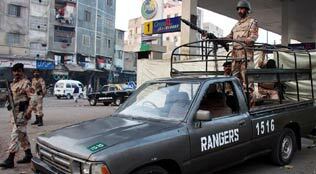 Police said gangsters opened fire in the Ranchore Line, Lyari and other areas of the city. According to security force the situation is now under control and they are patrolling the affected areas. After the violence a restaurant was torched in Goli Maar area of the city. KARACHI: At least eight people were killed and nine others wounded in different incidents of firing at Garden Town in Karachi on Thursday. While another man was gunned down in Orangi Town. Following the firing incidents, shops and business activities were suspended in the troubled areas. According to police, the firing incidents began when a beheaded body was found in Garden area. The deceased was later identified as Aamir. Meanwhile, his death triggered incidents of firing reported in Usman Abad, Dhobi Gath and Eid Gah areas. So far eight dead bodies have been brought to different hospitals of the city. There is no presence of police or rangers in the troubled areas while narrow street lanes make is impossible for armored vehicle to enter the area. While on the other hand, police remains mum on the firing incidents. They said that no details could be given until the situation was unclear. POK Politices will jeopardize Pakistan. Pakiastan Can’t solve his own Problems. How they dare to interfere Kashmir Politics ?? Anti-Indianism is not the solution. 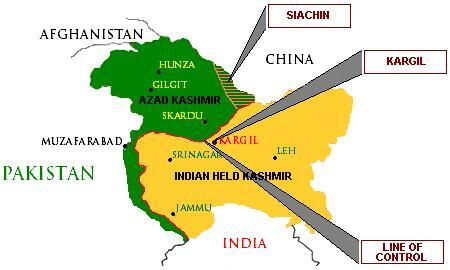 We should be a real friend of India and Kashmir to solve Pakistani terrorism. President Asif Ali Zardari. — Reuters photo. 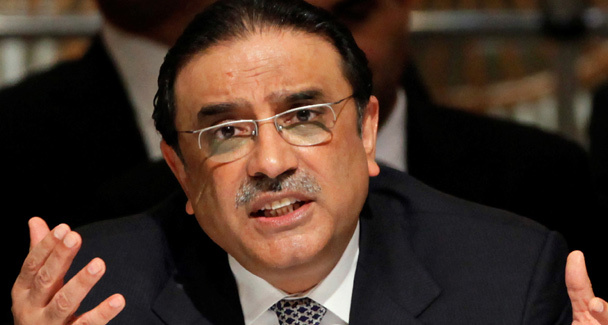 ‘Fighting for Kashmir’s liberation is Pakistan’s duty’ – Pak President Asif Ali Zardari. MUZAFFARABAD: President Asif Ali Zardari on Tuesday said all super powers should come forward to settle the Kashmir dispute.Addressing a joint session of the Azad Jammu and Kashmir Assembly and the Kashmir Council, President Zardari said India wanted to suppress the voice of the Kashmiri people through use of force. 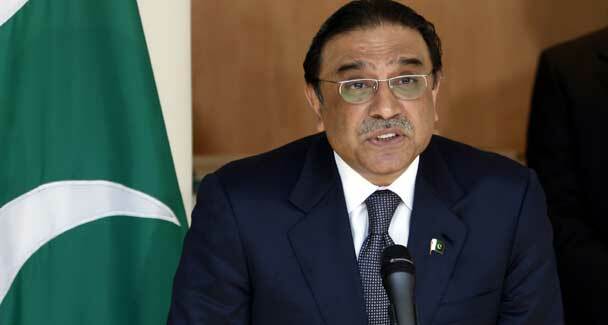 President Zardari said fighting for Kashmir’s liberation was Pakistan’s responsibility. Regional peace would not be possible without the Kashmir dispute’s resolution, he said. The president told the session that a committee on Kashmir Affairs had also been constituted. He also announced a countrywide increase in number of seats for medical students from the region. Courtesy : Dawn, Reuters & Others. Pak terrorists are not changed, even in detention. ISLAMABAD: Omar Saeed Sheikh, a detained Pakistani militant, had made hoax calls to President Asif Ali Zardari and the Chief of Army Staff, Gen Ashfaq Parvez Kayani, in a bid to heighten Pakistan-India tensions after last year’s terrorist attacks on Mumbai, investigators have told Dawn. Omar Saeed Sheikh, a detained Pakistani militant, had made hoax calls to President Asif Ali Zardari and the Chief of Army Staff, Gen Ashfaq Parvez Kayani, in a bid to heighten Pak-India tensions after last year’s terrorist attacks on Mumbai. But Maj Gen Athar Abbas, the military spokesman, finds the report unbelievable. ‘I am not his (Army chief’s) operator. I don’t know who puts calls through to him, but I think this can’t be true,’ said an incredulous Athar Abbas. Interestingly, when Omar Saeed Sheikh was making these hoax calls, the Lashkar-i-Taiba (LET) chief was also in Karachi, but it is not known whether Omar Saeed was acting under the guidance of Zakiur Rehman Lakhvi or on his own. The very next morning, Nov 29, Hyderabad jail was raided by intelligence agencies and over a dozen SIMs were recovered along with two mobile sets. Majid Siddiqui, the jail superintendent, was suspended. ‘I don’t know much but it is true that some mobile SIMs and mobile sets were recovered from Omar Saeed Sheikh when he was in Hyderabad jail. I got him transferred to Karachi jail because that is a far better place for such high-profile terrorists,’ Allauddin Abbasi, DIG Prisons, Hyderabad, told Dawn over phone. The authorities had a word with Saadia Omar too. She was advised to ‘control’ herself. The matter was then placed in the files of secret agencies marked as ‘secret’. The Federal Investigation Agency never interrogated Omar Saeed about the Mumbai attacks. Dawn’s efforts for getting the viewpoint of Tariq Khosa , the FIA chief, drew a blank. HIGH PROFILE: Omar, currently confined in a high security cell of Karachi Jail, has a long record of militancy, from kidnapping foreigners in Mumbai in 1994 to kidnapping Daniel Pearl in Jan 2002. Omar Saeed Sheikh was freed by India in Dec 1999 as part of a deal that saw New Delhi agreeing to release a number of militant leaders in exchange for the freedom of hostages on board an India plane hijacked to Kabul. Soon after his release from Indian captivity, Omar Saeed developed close relations with the LET leadership, including Zakiur Rehman Lakhwi. He was invited to a training camp in Muzaffarabad, the capital of Azad Kashmir, where he spent a couple of days delivering lectures to recruits. Sources said Lakhwi wanted Omar to join LET and give the organisation an international face. In Feb 2002, Omar was arrested for the murder of US journalist Daniel Pearl. The Poison of Hafiz Saeed. ‘India is an enemy and will remain so’- Hafiz. Now, Pro Taliban Hafiz Saeed hold forth on US aid bill. Saeed wants to promote terrorism in Pakistan. Jeopardises Pakistan– Indian Relation. Banned JuD chief Hafiz Mohd Saeed has joined the debate over conditions attached to US aid to be provided to Pakistan, charging that clauses asking the country to take action against militant groups had been included due to “Indian pressure”. Saeed, mastermind of the Mumbai terror attacks, told a congregation at Friday prayers at the JuD mosque at Chauburji in Lahore that the US had included clauses in the Kerry-Lugar bill asking Pakistan to take action against militant groups in Quetta and Muridke “due to pressure from India”. He, however, claimed the people will not allow this to happen. “The people of Pakistan and the army will not allow anyone to launch attacks on Quetta or Muridke. We will resist them,” he said. The JuD has its headquarters at Muridke, about 40 km from Lahore. Saeed, also the founder of the Lashker-e-Taiba, demanded that the government should not offer a hand of friendship to India as it is an “enemy and will remain so”. He also lashed out at the Pakistan government for “enslaving” the country by “accepting the tough” conditions in the Kerry-Lugar bill. “Reject the bill and trust god,” he said. Saeed appreciated the military’s decision to express concern over the Kerry-Lugar bill. The army’s top commanders said earlier this week that the clauses in the bill could affect Pakistan’s national security interests. The JuD chief has stepped up his criticism of India and the US since police in Faisalanad registered two First Information Reports against him under the Anti-Terrorism Act for inciting people to wage jehad or holy war against infidels and for seeking funds for his banned group. Though police officials gave an impression last month that Saeed had been placed under house arrest in connection with these two cases, it later came to light that no formal order had been issued for his detention. Police officials have also said that law enforcement agencies had only enhanced Saeed’s security in view of reported threats to him. Though Saeed was put under house arrest in December last year after the UN Security Council declared the JuD a terrorist group, he was freed on the orders of the Lahore High Court in June. With thousands that continue to die so harrowingly in bomb blasts and suicide attacks year after year, Pakistanis still consider terrorism to be a secondary problem? As the country’s electronic media and drawing-rooms buzz with the ins and outs of the Kerry-Lugar Bill, yet another suicide terrorist attack ripped through the already devastated and blood-soaked streets of Peshawar. Some would say such attacks were imminent in the light of the Army’s affirmative action against barbarians called the Taliban, and especially after the leader of Tehrik-e-Taliban Pakistan’s leader, Baitullah Mehsud was killed in a drone attack last month, but there is no justification whatsoever for the knee-jerk manner the mainstream Pakistani media handles such a threat. The question is, why in the face of such a threat and destruction do we casually steer away our intellectual and emotional energies towards abstract and rhetorical issues such as ‘sovereignty’ and ‘self-reliance,’ when we as a nation have exhibited such helplessness in addressing and arresting the more tangible threat and issue of mass terrorism? Debates about lofty ideals and desires of national autonomy and ‘ghairat’ seem rather frivolous and hollow in a country imprisoned by its own delusional pretensions of being a ‘nuclear Islamic power;’ always trapped and forcibly obliged to flex its withering muscles against big bad superpowers, while behaving like utter cowards and false supermen when it comes to the question of terrorism. Over and over again, many Pakistanis, their politicians, their glorified media personalities and holy men have tried to ignore the issue, treating it as a secondary phenomenon compared to the ‘more pressing issue’ of Asif Ali Zardari’s wealth, Altaf Hussain’s self-imposed exile and Meera’s domestic ordeal – as if trying their level best to obscure the issue of terrorism only because the bloodshed that takes place in the name of God might ridicule the already ridiculous notions of political Islam that the state of Pakistan has been flaunting for so many years now. To defend all that started to socially and politically de-evolve in the spheres of religion, state and society during the Zia-ul-Haq dictatorship in the 1980s, a number of lunatics in the shape of discarded politicians, conspiracy theorists, TV anchors and maulvies can be heard loudly distracting the people’s attention from the threat that Pakistan faces from within. They either start blaming imagined intrigues plotted outside Pakistan or they shamelessly start defending murderers and barbarians as helpless and hapless consequences of poverty and injustice. Can’t we already see that it is these lunatics that continue to be given vital space in the mainstream media to go on glorifying the ‘brave deeds’ of the barbarians, going as far as (rather audaciously) linking these deeds with us Pakistanis’ oh-so-noble cry for sovereignty? Are we mad? That’s what it seems. The gruesome insanity of sectarian clashes and terrorism in the fine name of God across the last three decades is bound to have impacted our collective sense of sanity. By tomorrow each one of us who is not apparently a bearded maniac, will forget about this attack and tragedy as well, and move back to our fixation with imagined enemies and the political soap operas that we love to create about famous politicians. We all know about the why’s and who’s of terrorism in Pakistan. And yet, those who were lucky to survive terrorist attacks, or those whose loved ones were maimed so mercilessly in these attacks, we will go on wagging our fingers telling them they died because we are not good Muslims, or they died because certain elusive enemies of Islam are out to destroy our country and religion. Those willing to point out the real perpetrators will at once be denounced as being western puppets and agents of anti-Pakistan/Islam elements. It is as if the few who are ready to speak out the truth in this respect, loiter among a milieu of mass delusion and denial, and a society that has collapsed from being a neurotic mess to becoming an almost incurable bundle of noble-sounding psychosis. Couple this state of being with a collective love affair we have with nuclear devises, all I can say is God have mercy on us all. Militants Pressurize for Begging. Foreign Funds Channelized to Militants. Begging for Sponsored Terrorist Groups. Some days ago, Ex-President of Pakistan, Parvez Musharaff said that the aid provided to Pakistan by the US has been used for directing its hostile operations against India. Now, Nawaz Sherriff, PML-N Chief raised his voice about the mode and purpose of getting and utilising the foreign aid coming to Pakistan. The Pakistan Muslim League-Nawaz ( PLM-N) has blamed the Zardari Government for failing to achieve any concrete results from the ‘Friends of Democratic Pakistan’ moot. “Parking of funds for Pakistan with the World Bank is a clear sign that no country in the world is willing to trust this regime,” The Dawn quoted PML-N Central Spokesman Ahsan Iqbal, as saying. Iqbal added that channelling funds through the World Bank would put added burden on Pakistan since it will have to pay for additional costs in the shape of expensive World Bank bureaucracy overheads. He also said that the government was facing a ”trust mega deficit” both at home and abroad due to its lack of transparency, poor governance, and cronyism. “Inside the country, people, opposition, and investors are increasingly getting skeptical about the government”s will and competence to deal with the challenges the country faces,” he said. “The nation wants to know where are the 100 billion dollars which Zardari promised to bring in the country. It is a shame that the government is making Pakistan look like an international beggar,” he added.